As a top-level property development and management company, we never stop our pace and keep doing things to improve our management. Here is a list of recent activities in which you may track down what we have done recently for our guests, our tenants, our stakeholder and for the society. Man Hing Hong Properties Company Limited has been awarded the “10 Years Plus Caring Company Logo” by The Hong Kong Council of Social Service for the recognition of building a cohesive society by promoting strategic partnerships among business and social service partners, and inspiring corporate social responsibility through caring for the community, employees and the environment. For 3 consecutive years, Man Hing Hong Properties Company Limited was granted the “Partner Employer Award” by The Hong Kong General Chamber of Small and Medium Business for demonstrating our corporate responsibility in providing training opportunities and practical work experience to graduates of local technical institutes and universities. Man Hing Hong Properties Company Limited has won the first runner-up at “Highest Highest Percentage Saver Award (Property Management)” launched by Friends of the Earth. This award is granted to companies achieved an overall reduction of at least 5% in electricity consumption during the contest period as compared to the same period in 2015/2016, and the top three property management companies with the highest percentage of energy saved will receive Certificates of Commendation. Man Hing Hong Properties Company Limited continued to participate in “2016 Security Services Best Training Awards” and was granted the “Award of Gold (Licensed Security Company – Type 1)“ for the second year. Man Hing Hong Properties Co., Ltd. was granted the “Family-Friendly Employer Award” in October 2016 jointly by The Home Affairs Bureau and The Family Council in recognition of our achievements in implementation of family-friendly practices and policies. We simultaneously received the “Award for Breastfeeding Support” which was a newly added Award under Family-Friendly Employers Award Scheme of Year 2016, commending our Company in providing suitable facilities in the workplace to support employees who are breastfeeding. 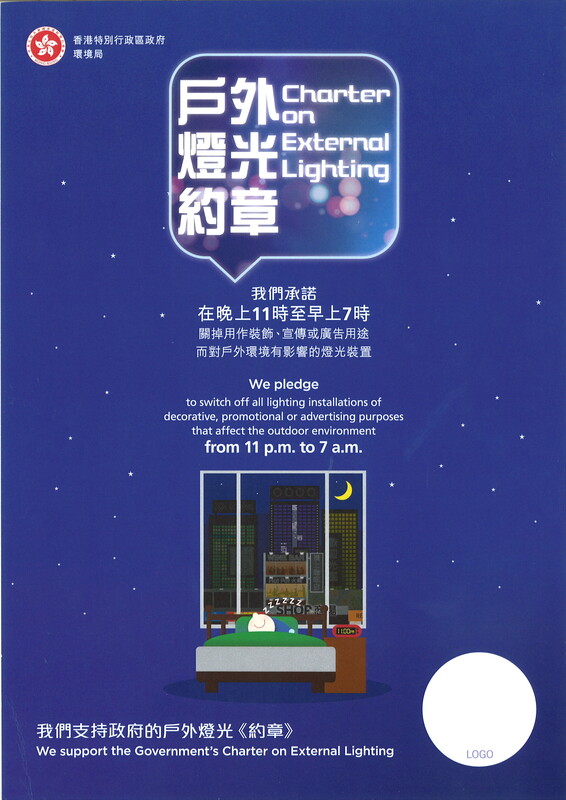 The "Charter of External Lighting" is launched by the Environment Bureau, and invites owners of and responsible persons for external lighting installations to switch off lighting installations of decorative, promotional or advertising purposes which affect the outdoor environment during the preset time from 11 p.m. or midnight to 7 a.m. on the following day. It is hoped that the Charter will help to minimize light nuisance and energy wastage. As announced in the Signing Ceremony held on 1 April 2016, Man Hing Hong Properties Company Limited has signed the Charter to show its support and has pledged to switch off non-essential external lighting installations on all buildings during the preset times. 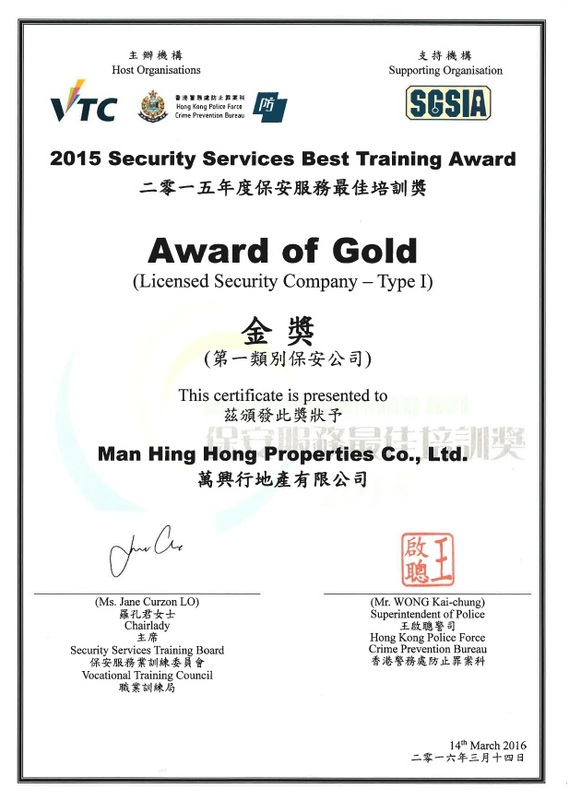 For the first time, Man Hing Hong Properties Company Limited participated in 2015 Security Services Best Training Award and was granted the Award of Gold (Licensed Security Company – Type I). Our effort to provide on-job training to the frontline security staff in the past year was well-recognized. The Award is organized by The Hong Kong Police Force and Security Services Training Board. Luard on the Park became the second member of our newly established brand of serviced apartment – Loplus, and was renamed as Loplus@Johnston. 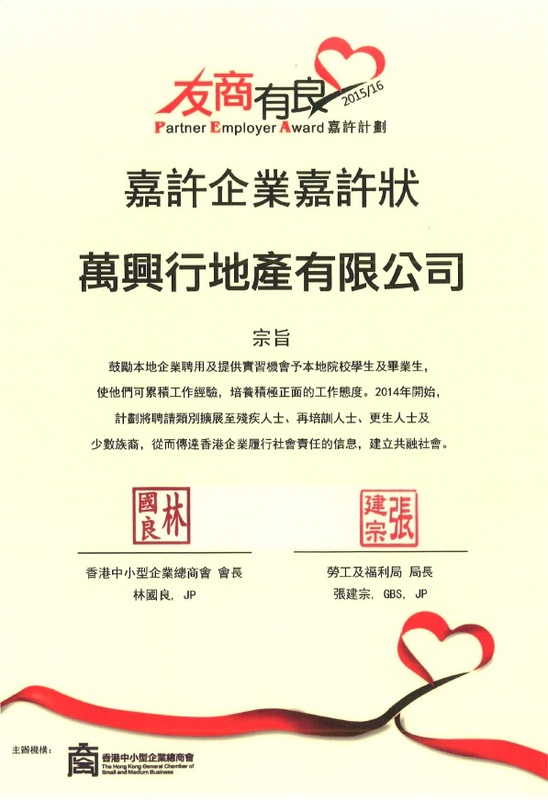 Man Hing Hong Properties Co. Ltd. was granted the “Partner Employer Award” in November 2015 by The Hong Kong General Chamber of Small and Medium Business for demonstrating our corporate responsibility in providing training opportunities and practical work experience to graduates of local technical institutes and universities. After the renovation of our largest residential building - Harmony Mansion, we are proud to present the newly refurbished serviced apartment – Loplus@Hennessey. From Harmony Mansion to Loplus@Hennessy, the building has been converted into a block of top quality serviced apartments with over 200 suites, offering unique lifestyle and contemporary living to business executives, expatriates and demanding local and overseas families. “Man Hing Hong Property Management & Agency Co. Ltd.” is renamed to “Man Hing Hong Properties Company Limited” as at April 2015. 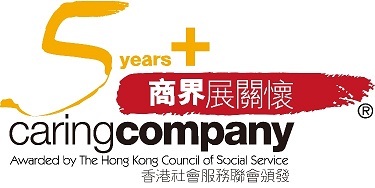 Man Hing Hong Property Management & Agency Co Ltd was once again awarded “the 5 Years Plus Caring Company Logo” in December 2014 by the Hong Kong Council of Social Service (HKCSS). We have been awarded the “Caring Company Logo” for 7 consecutive years in recognition of our ongoing commitment in caring for the community, employees and environment. Man Yee Car Park is one of the most popular car parks in Central. To enhance the standard of services to our customers, we undertook a substantial refurbishment project for the property. All works were completed in Nov 2014. Please come and enjoy the brand new parking experience in Man Yee. As an integral part of the image building exercise, the new website of Man Hing Hong Group was completed and was formally launched to the public. With continuous achievements in the Caring Company Scheme, Man Hing Hong Property Management & Agency Co Ltd was awarded the 5 Years Plus Caring Company Logo on December 2013 in recognition of our commitment in Caring for the Community, Caring for the Employees and Caring for the Environment over the past years.